A concise anthology including a wide range of eighteenth-century music. Baroque music in its cultural, social, and intellectual contexts. In The Late Eighteenth Century, Wye Jamison Allanbrook presents twenty-six readings that reveal how the music establishment of 1750-1800 saw itself. 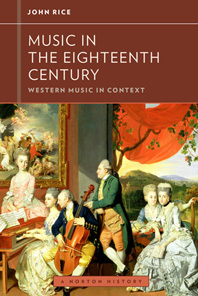 Eighteenth Century Music in its cultural, social, and intellectual contexts. John Rice's Music in the Eighteenth Century takes the reader on an engrossing Grand Tour of Europe's musical centers, from Naples, to London, Berlin, Vienna, Prague, and St. Petersburg —with a side trip to the colonial New World. Against the backdrop of Europe's largely peaceful division into Catholic and Protestant realms, Rice shows how "learned" and "galant" styles developed and commingled. While considering Mozart, Haydn, and early Beethoven in depth, he broadens his focus to assess the contributions of lesser-known but significant figures like Johann Adam Hiller, Francois-André Philidor, and Anna Bon. Like the other volumes in the series, Music in the Eighteenth Century brings a fresh perspective to the study of music by emphasizing social, cultural, intellectual, and political contexts of the music. John Rice looks far beyond the notes on the page or the details of composers’ lives to embrace audiences, performers, institutions, and social settings. For example, the text transports us to London in the 1790s, where Joseph Haydn, having spent his life as a salaried court musician on the Continent, discovered his music's true value on the "open market." Along with the other volumes in the series, Music in the Eighteenth Century is designed for maximum flexibility in the classroom. The text may be packaged with the accompanying 29-work anthology, with Strunk’s Source Readings in Music History, or with Norton Critical Scores, all at a significant discount. The text is also available as a low-priced ebook.